Young Adult, Contemporary with fantasy elements. Inspired by Judy Blume’s Forever and Virginia Woolf’s Mrs. Dalloway, this novel by award-winning author Patrick Ness is a new classic about teenage relationships, self-acceptance—and what happens when the walls we build start coming down. From the New York Times-bestselling author of A Monster Calls comes a raw, darkly funny, and deeply affecting story about the courage it takes to live your truth. Never pass up the chance to be kissing someone. It's the worst kind of regret. Blame is a human concept, one of its blackest and most selfish and self-binding. Blame is something that is shared and denied in equal measures. 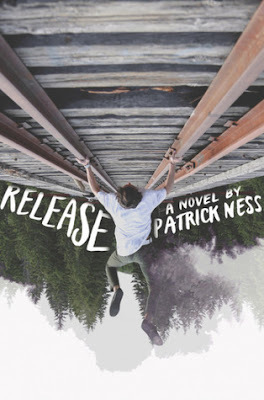 There's no denying the fact that Patrick Ness is a literary prodigy. Every single book he sends out into the world is amazing in its own unique and unforgettable way, and his latest one, Release, is no exception. There's no preparing yourself for the tour de force that is Ness' storytelling either, for every single one of his books is so very different from the last one. He is such an eclectic writer - dipping his toes in fantasy, science fiction, realistic issue-driven fiction and more lighthearted, though still thought provoking contemporary fiction - and I have immense respect for him. Release is, in many ways, a genre breaker. There are two storylines that for the most part of the book seem completely disjointed and unrelated to one another to the point you start wondering if perhaps there was a printing mistake and you ask yourself: are these two different books I'm reading? How will all of this come together? And it's not just a matter of two separate plot lines that seem disconnected, it's also that those two storylines are two completely different genres. In the first storyline, we spend one day following seventeen years old Adam Thorne, watching his life slowly come apart at the seams, as everything he holds dear is ripped away from him. Between dealing with his homophobic and judgmental family, saying good-bye to his ex-boyfriend Enzo, and having to dodge unwanted advances from his gross boss Wade, Adam's life is quickly spiraling out of control and his only hope is to find peace in the release. In saying good-byes and realizing that the end of one thing can be the beginning of something else, and there are days when the best thing we can do, is to simply let go. The second storyline centers around a girl that was chocked unconscious and then thrown into the lake with bricks in her pockets by her junkee boyfriend, the Queen and the Faun. Yep, you've got that right. We are following a dead girl, and two fantastical creatures on a quest to find the release and let go, much like what Adam Thorne has to do, only... well, different. Initially, I wasn't quite sure what to make of this part of the book. It was undeniably a beautifully written, mesmerizing and moving story, but I was confused as to how it all fit with Adam's story. And I can't tell you much about that without spoiling the ending for you, but definitely trust in Ness' ingenius plotting skills, and you'll be rewarded with a phenomenal, incredibly well-crafted, poetic ending. Release deals with some real heavy, hard-hitting issues, including sexual assault, homophobia, drug abuse, murder, family issues and more. It's not an easy book to read, though Ness handles all those topics with incredible sensitivity and grace. There are parts of this book that can be very upsetting, particularly the ones with Adam and his preacher father. Adam's father is very religious and very, very strict. His character doesn't have any redeemable qualities at all, he's cold, unforgiving (even though he preaches forgiveness) and, well, downright homophobic. Reading about everything Adam had to endure at home, from his own parents and brother, made my heart ache. When Adam finally gathers the courage to come out to his dad, he gets no support whatsoever and is instead told to basically "pray it away". Another character that I'm not too fond of tells Adam that his "kind of love" is not real love and he should try harder to be normal. However, it is really important to mention that all those (horrible, disgusting, abhorrent) views are always challenged - usually right after they happen, sometimes later on in the story. It is made very clear that this kind of thinking is completely unacceptable. Overall, Release is a short but very meaningful book that will stay with you long after you turn the last page. It's a heartfelt and genuine portrayal of real teens with their complex feelings and struggles. The cast of main and secondary characters is incredibly vivid, believably flawed and oh-so-beautifully realized. Prepare to be profoundly affected and forever changed.